Club Penguin Cheats by Mimo777 Club Penguin Cheats by Mimo777: Happy77 Wants Your Puffle Questions! Club Penguin's Happy77 said she has heard lots of you wanted some tips on taking care of your puffles, so she thought she would interview a puffle expert to get us some tricks. So, send her your puffle questions by posting a comment on the Club Penguin blog. She will pick some of the top questions, and then ask their puffle expert for tips! The answers will be posted later this week. Hmmm, what kind of questions do you have about puffle care? I asked them HOW TO KNOW WHAT TO DO TO YOUR PUFFLE!! 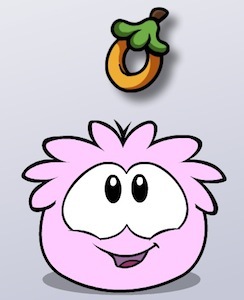 So a puffle is sad. OK, so now what? It just sits there and frowns! How are we supposed to know if it wants to sleep, eat or play?? This may not be 100% related to this topic, but if you had copied that pink puffle picture of CP, you may be violating copyright policies, unless you have asked permission. Just a note (nothing personal)! ------------------------------------------------------------Make your puffle eat sleep and play! Seriously?!!? My puffle has a frowny-face but i dont know whether or not it wants to sleep, eat or play! Talk about annoying! Thx 4 reading.